Library Wars is an interesting manga for a number of reasons. First of all it is loosely based upon the highly popular light novels series of the same name. It also happens to be a shojo series which in and of itself is an interesting choice considering the high concept of the series. Perhaps the most interesting part of Library Wars is how it manages to be both simultaneously cliche ridden but also feeling absolutely fresh. It is a tight rope walk to say the very least but Kiiro Yumi manages to keep her balance throughout this entire first volume making for what is a great introduction to what looks to be an intrigue filled romantic tale of love and war. For a shojo manga, Library Wars has a surprising high concept. The idea is that the government has let the censors run wild and they are deciding that all manner of books should be destroyed, often for very frivolous reasons. In order to prevent books from meeting the fire, Libraries have become militarized to protect books against the censors. There is a great deal of intrigue there and Kiiro Yumi does a good job of revealing a little about it in this volume without giving it all away too soon. There is still a lot to learn about this world and the titular ‘library war’ that it is waged in and that is just fine. We meet protagonist Iku Kasahara in training to become part of the Library Defense Force. She wants to fight to protect books much like her hero and ‘prince’ did. The main mystery of this volume revolves around who this man may be, but there is more than enough hints as to who it could be. The prince of her past saved her book and touched her on her head, a touch that she fell in love with. Of course over the course of this volume several guys touch her head making her wonder if they could be her prince. It does seem pretty evident however that the prince is none other than her superior Dojo. Time will tell if that turns out to be the case though. The story progresses quite quickly in this first volume with Iku being recruited to the Library Defense Force only three chapters in after a reckless act of trying to stop the Media Betterment Act from taking a child’s book. She is recruited alongside a perfectionist by the name of Tezuka, he naturally despises the hapless Iku and looks to undermine her at every turn much to the chagrin of his superiors. It looks that Tezuka will continue to serve as Iku’s rival in the coming volumes and he certainly makes for a nice antithesis of Iku who is by and large a complete screw-up albeit one who tries her best and refuses to give up. There was an interesting atmosphere to the proceedings of Library Wars that I feel I must mention. The libraries are considered to be a place of freedom in this manga yet there was a strange sense of claustrophobia in the library scenes, almost as if they were trapped. I’m not sure what Kiiro Yumi was trying to convey with this tone and atmosphere but it certainly gave the feeling that the Library Defense Force isn’t as free as one would like. I’m interested to see that explored more in future volumes. While Iku is seemingly at odds with nearly all of the other cast in the manga, she does manage to find some understanding with Tezuka and Dojo by the end of this volume, how long that will last is another question altogether. Regardless this was a fun first volume that set the stage for things to come by building up the world and concept of Library Wars as well as developing its characters beyon the cliche situations they often find themselves stumbling upon. There is potential here and I look forward to what lies ahead for Iku and her many princes. Visually Library Wars is your standard shojo fare. There isn’t anything particular unique about it, which isn’t necessarily a bad thing. The shojo style of big expressive eyes and stunningly handsome bishonen is well served here to supplement the romantic elements of the manga. It is simple and neat with a great measure of detail to environments as well as characters themselves. The character designs are likewise simple yet distinctive enough that they leave an impression. Yumi does a good job framing and creating atmosphere with her art, but never verges on brilliance instead resigning to a more safer aesthetic. I’m hoping to see her flex her artistic muscles a little more in the future as there is a potential here that she doesn’t seem ready to reach for, but with a little more confidence she could create something genuinely beautiful. Library Wars volume 1 has a few little extras for readers to take a gander at. I personally found the numerous author comments throughout the volume to be rather enlightening about Kiiro Yumi’s thought process while working on the series. Yumi wants to do the original light novels justice and constantly doubts herself and questions whether she is actually good enough. It is a compelling inner struggle that really shows on the page. There is also a bonus omake chapter and even a message from the original creator of Library Wars Hiro Arikawa, which serves as an excellent exclamation point to all of Yumi’s commentary. Yumi doubts herself but Arikawa sees something special in her. It was a very interesting read an a welcome addition to this volume. What we have here is a manga that shows a lot of potential. 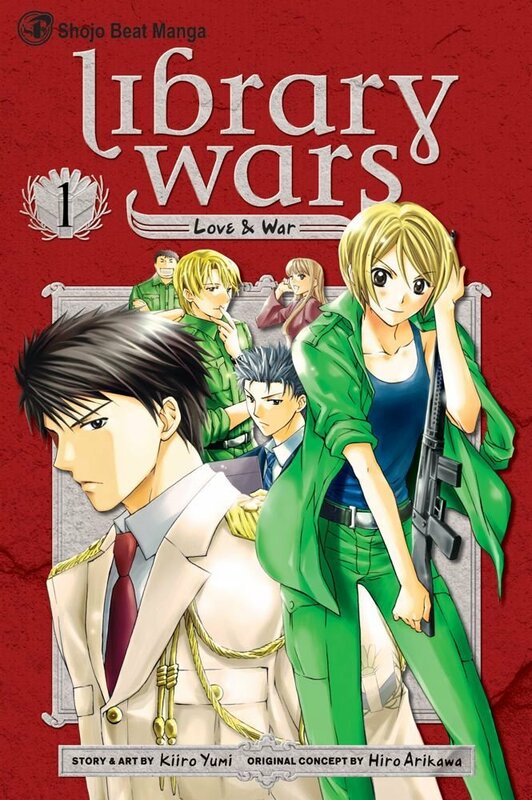 Library Wars has all the right tools to be a great shojo manga, this entire first volume was really all about setting the stage for things to come, so it will be interesting to see whether it puts those tools to use in the future. For now it is hard to tell where Library Wars will go next, there doesn’t seem to be an endpoint it is heading towards and it doesn’t appear to have a whole lot of direction, but as an introductory volume Library Wars volume 1 does a great job at creating intrigue and building its foundations. It is a fun volume of manga that while not as thought-provoking as its concept promises to be manages to be quite a delightful read none the less.